Well my friends, the countdown is on. We only have 2 more days in this amazing part of the world. I will be sad to say good-bye. Here are a few more photos of our experiences in La Zubia, Granada and the south of Spain. 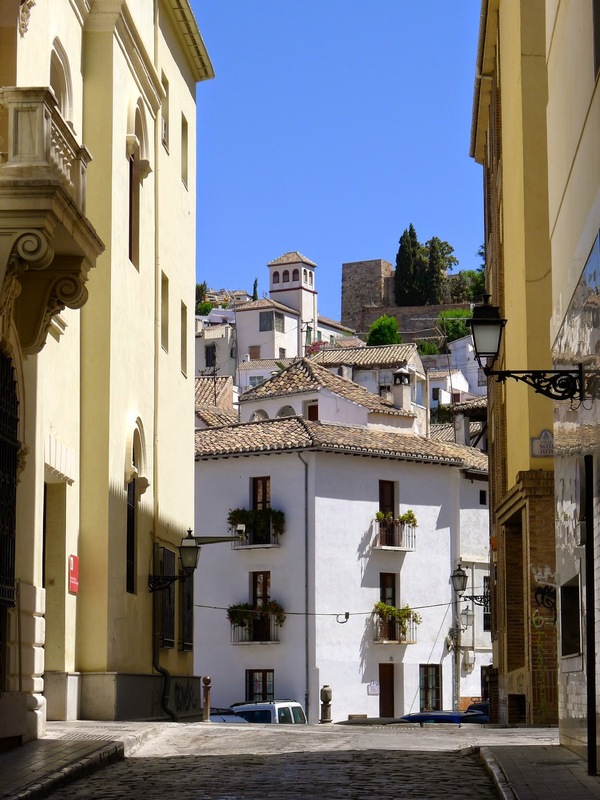 We took a drive to the city of Jaén, the olive oil capital of southern Spain. The olive tree orchards reminded me of a chenille bedspread! 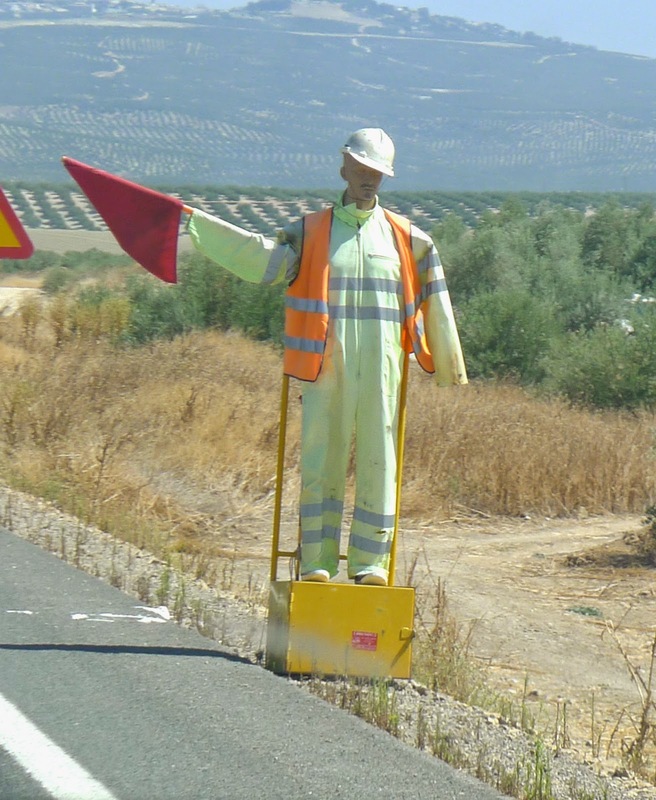 On our way to Jaén, many stretches of the highway were under construction. But not to worry! This roadside flagger had it handled. As you all know, Joe has a serious love affair going on with his beloved jamon iberico. We stopped for lunch in the village of Baéz and this is what he ordered. Toasted bread drizzled with extra virgin olive oil, pan-fried wild mushrooms, jamon iberico with grated manchego cheese on top. Joe is considering joining the food importing business when he returns to Canada. If only to be re-united with his Iberian ham. We have the BEST neighbours! Our exchange family's parents live right next door. Every evening they come over to water the planters and hose down the tiled patio. We chat with each other. They speak in Spanish, we speak in English. They can't understand us and we can't understand them. But with lots of hand gestures and the help of Google Translate, Joe and I can sometimes get the gist of what they're saying. Sometimes. 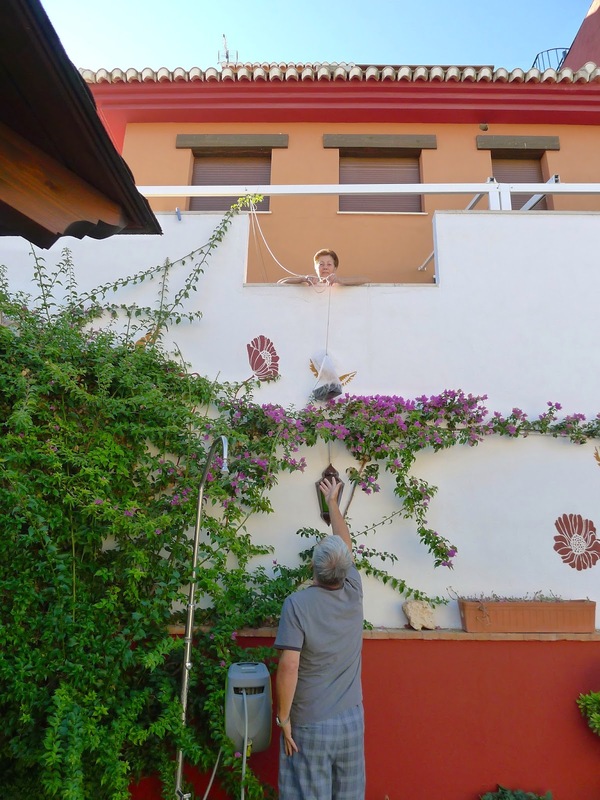 Not only do the neighbours water the planters, but every few days Maria lowers food down for us. Bags containing tomatoes, peppers, soups and stews all find their way into our appreciative outstretched hands. Gracias Maria! 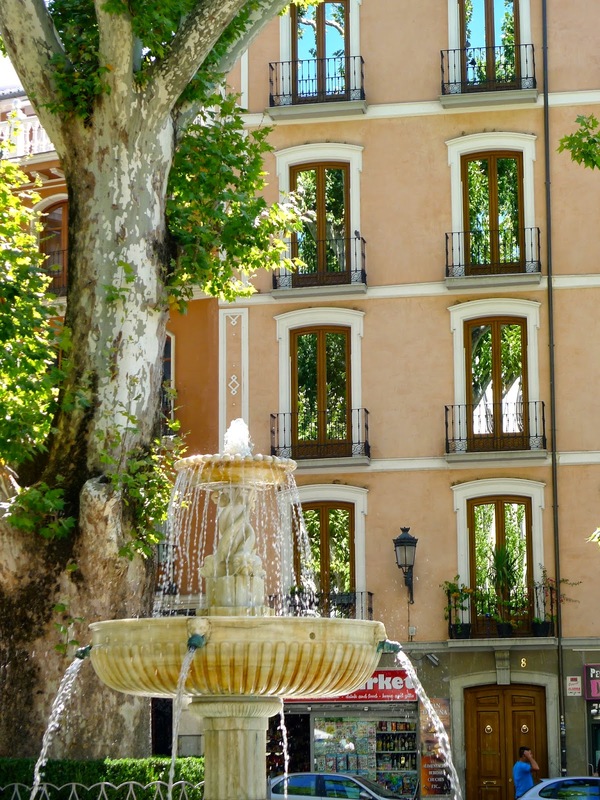 Alhambra is undoubtedly the jewel in Granada's crown but the rest of the city is also beautiful. 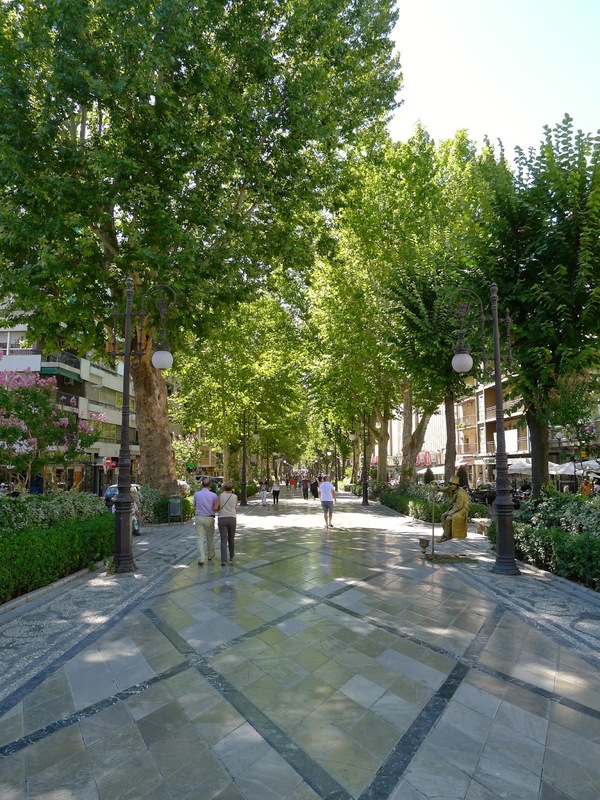 The streets are shaded to keep cars and pedestrians cool in the summer heat. This underground parkade was built around an excavated 2,000 year old Roman wall. Granada is blessed with many pedestrian walkways. I love how the mirrored windows in this building reflect the trees and the sky. 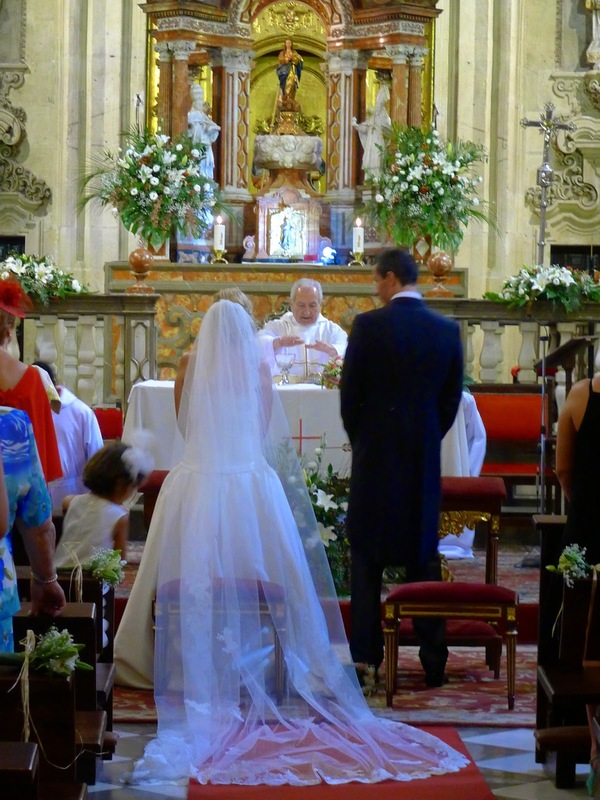 We popped into a side chapel of Granada's cathedral only to stumble upon a wedding in progress! We, along with other tourists, were surprised to be guests. I wonder how many vacation photos these newlyweds are in? Many beautiful buildings and lamps line Granada's streets. Arab shops in the Albacín neighbourhood. Our home exchange family graciously offered us tickets to see a futbol match. What fun! We joined the throngs of Granada C.F. supporters for pre-game beer and tapas. Many fans greeted the team bus. Joe was no exception. As the stadium filled up, I marveled at the beauty of the setting. The passionately chanting, cheering and singing fans were as enjoyable to watch as the soccer game. But it is the people we meet who truly make our travels memorable. It is such a pleasure to be included in the lives of the locals. We met this fine family at the beginning of our stay in La Zubia in July. Last night they invited us to their town for beer and tapas. And quite a party broke out! Their friends and family joined our table. We drank, we ate, we laughed until the wee hours of the morning! 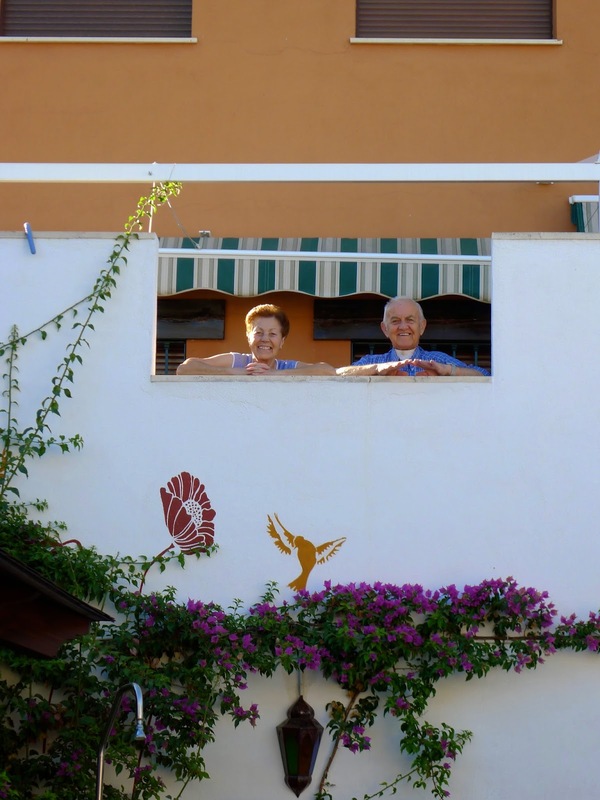 Gracias Manuela and Juan for inviting us to your home. We plan to squeeze every last drop of Spanish goodness out of the next 48 hours. Tonight we are returning to Alhambra at 10:30pm to revel in its night-time magic. Tomorrow afternoon we are watching the 6th stage of La Vuelta (Spain's premier cycling race) here in La Zubia. We have a lot to cram into these last two days. But we can do it. I have no doubt about that.